I looked up from my newspaper. It’s only the end of May, but I was reading about new shows coming on in the fall, shows that I would never remember once that season actually arrived. My son had just asked me a question from Trivia Crack, a game we like to play on my phone. I knew I wasn’t an expert on Fast and Furious movies, but still . . . They’re about cars, right? I returned to the paper along with a bite of my sausage, egg, and cheese biscuit. We had decided to take in an extra destination on our usual Sunday morning routine with a stop at the doughnut shop. 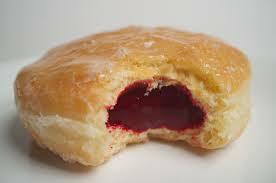 I really didn’t need a doughnut – so I got one with strawberry filling, that way I could count it as a fruit. And the sausage biscuit thing? That fulfilled my recommended daily allowance of grease or some other necessary nutrient in my diet. Ok, admittedly not what I needed (so much for running three miles earlier). Actually, not what either of us needed. But it’s hard to beat a relaxed time with your kids. We were the only ones in the place, and time was, as the Rolling Stones said, on our side, at least it was on this occasion. “It’s Brazil,” he tells me matter-of-factly. Another question right. We’re the only customers sitting down to eat. A handful of others come through, make a choice among a selection where there is no wrong choice, and leave with their bag of tasty calories. After reading about all the shows I won’t watch in the fall, I glance down the page. Ahhhh, the horoscopes. “Hey Sam, would you like me to read your horoscope,” I ask, already knowing the answer. “Yes,” he says enthusiastically, his attention away from my phone. Nothing like the important things in life to distract you from the trivialities. “You don’t even know my birthday?! !” he asks in mock surprise. And it goes on like this. Trivia questions, unhealthy food, and a Sunday paper. I knew it wouldn’t be long before we’d be home, with work and distractions pulling at me from all directions. But it was nice to have that time together. To have A time together. A moment where there are no time constraints or responsibilities. A time where the two of us can share a doughnut. And a laugh or two. ← Am I doing this motherhood thing right?